The Essence of Reiki 1 is the first Reiki Manual in our series of 3 Reiki Manuals covering the complete guide to the Usui method of natural healing. In the Usui Reiki Level 1 Practitioner Manual you will be guided through an introduction to Reiki and 17 further Reiki 1 lessons that we teach in our Reiki Level 1 Workshops and Reiki Level 1 Video Home Study Courses. You will discover What is Reiki, How Reiki Works, The Five Reiki Principles, How to Treat Yourself and Others with Reiki and how to treat Animals with Reiki. This is a comprehensive Reiki 1 Manual based on our own experiences since 1997 teaching Reiki to over 50,000 students around the world. Adele Malone is a Certified Usui Reiki Master Teacher and Spiritual Medium, with more than 20 years experience practising and teaching Reiki. Co-Author Garry Malone is also a Certified Usui Reiki Master Teacher and Reiki Business Coach with decades of training and business coaching experience. The Essence of Reiki 2 - Usui Reiki Level 2 Advanced Practitioner Manual: The Complete Guide to the Second Degree Usui Method of Natural Healing. The Essence of Reiki 3 - Usui Reiki Level 3 Master Teacher Manual: A complete guide to the third degree Usui method of natural healing. Adele and Gary provide a fantastic product and in the back of the book there is a link to gain free access to their Level 1 Reiki course, which includes a free distance attunement and certificate, among other things. They are of the belief Reiki should be available and accessible to everyone and have truly excelled in their goal. I am excited to be starting this learning process and have already booked my attunement and received a personal message from them because I had to double check I had entered information correctly. Fantastic customer service to boot. I liked this very much. Was able to get a different point of view from the Author compared to my teacher. Covered other areas I had not known. thank you. 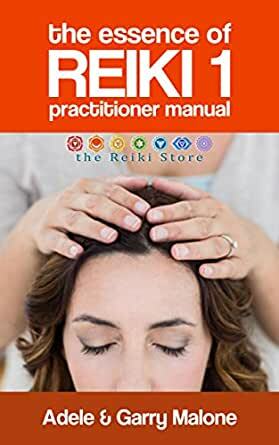 A very well written Reiki practitioner book with details in images that so easy to follow. Great book for reference. Good read to get different perspective to what is being taught in class.